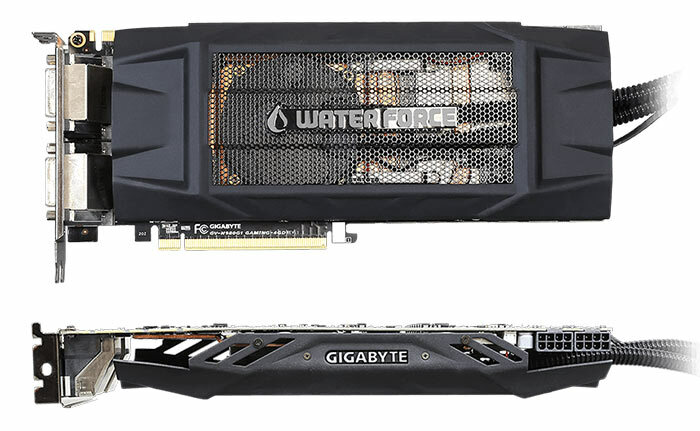 Gigabyte has announced the GeForce GTX 980 WaterForce (GV-N980WAOC-4GD). As you might guess, this is a graphics card based upon an Nvidia GeForce GTX 980 GPU, with 4GB of GDDR5 memory (on a 256-bit bus), and fitted with a 'WaterForce' all in one closed loop water cooling system. Out of the box users can enjoy this graphics card running at Base: 1228 MHz / Boost: 1329MHz (or 1253/1354MHz in OC Mode). Due to its adept liquid cooling solution the new Gigabyte graphics card facilitates "superior overclocking capabilities". The usual Gigabyte OC GURU II software is supplied for easy speed tweaking. We are told that Gigabyte's full coverage cooling apparatus covers the GPU, VRAM and MOSFET, requiring no additional fans to be fitted to the board. The radiator connects to the water cooling block via robust 45cm SFP tubes transporting fluid from the low-noise pump. The coolant is chilled using a 120mm 'silent fan'. 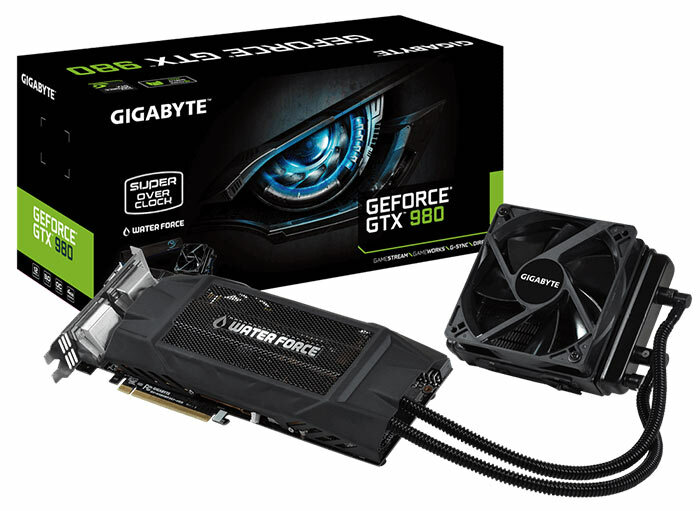 Overall Gigabyte says its GeForce GTX 980 WaterForce card "is able to perform up to 38.8 per cent cooler than the reference cooling in operating temperature for ultra-stable gaming in near silence". Gigabyte has selected the GPUs destined for these WaterForce cards using what it calls 'GPU Gauntlet Sorting Technology'. That sounds like Gigabyte's way of binning GPUs, as it elaborates; "Only the strongest processors survived can be qualified for the GTX 980 WATERFORCE, which can fulfil both gaming enthusiasts’ and overclockers' expectations with greater overclocking headroom, and higher, stable boost clocks under heavy load". 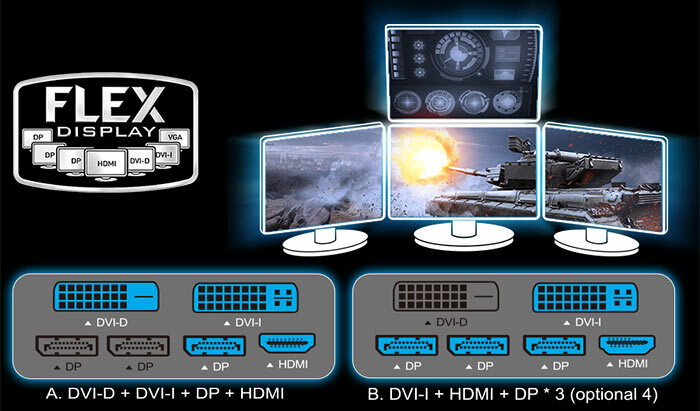 The roster of output ports on the graphics card include; Dual-link DVI-I / DVI-D / DisplayPort x3 / HDMI. Those who like LED bling should be happy to hear that the Gigabyte GeForce GTX 980 WaterForce features an eye-catching LED illuminated GIGABYTE logo. Users are reminded that a 600W PSU is a requirement for this GPU (with two 8-pin external power connectors). A free gaming mouse pad is included in the box. Gigabyte hasn't indicated any pricing or availability but has published a video guide to fitting this graphics card, see below. Whilst browsing the Gigabyte Gaming YouTube channel I noticed that it has published a video demonstrating the 'XTREME Protection' afforded by its aerospace-grade PCB coatings. In this video a Gigabyte employee demonstrates this aspect of durability by spreading 'BBQ Sauce' over an installed, powered up and running graphics card. He explains that he didn't spread it too thickly, as he doesn't like his graphics cards too salty.